On Saturday, April 28, the Jubilee! 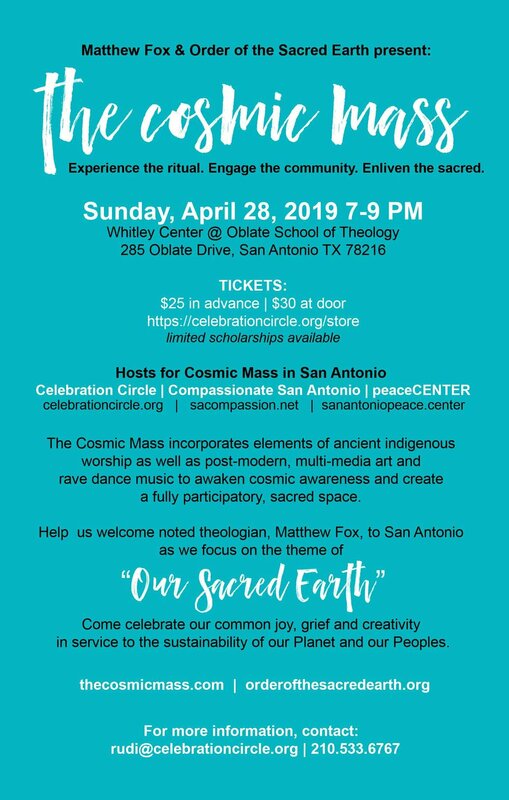 Creation Spirituality Community will host a Cosmic Mass as part of the Creation Spirituality Communities gathering in Asheville, NC. Details yet to be announced....stay tuned! The Cosmic Mass comes to the Washington National Cathedral with the theme "Seeing Deeper, Healing Deeper." Space is limited - register early so you don't miss this historic event! Doors open at 6:30; ceremony begins at 7:00 p.m. The Retreat is a three-day weekend event scheduled for Friday, August 4th through Sunday, August 6th, 2017, and presented by Seven7Sisters.org and produced by Starsinger. Seven7Sisters unites creative beings from all different genres into one breath, one united voice, one prayer and one collective movement to catalyze positive changes that are necessary at this time on earth. This ceremonial weekend is primarily held and led by the lineages of the sacred feminine from different traditions in the world and will inspire and enhance creativity while activating true potential. Three-day Ceremony Tickets are priced at $220 dollars. Day Passes are priced at $70 dollars. Night Passes are priced at $54 dollars. All Tickets are available online at Pleiadian Productions here. In The Cosmic Mass we will journey with the theme of "What We Share," through the Four Paths of Creation Spirituality; simultaneously we’ll be graced by the activation of the visual Seals of the Seven Voices. Together and in a sacred space we will hold and celebrate the Positiva: joy, beauty and awe! In conjunction with its duality called the Negativa: we’ll grieve the pain together in what we share then, emerge in the Creativa, to bless each other and to receive them. The next step is to culminate in the Transformativa. In this, we will get fired up in order to return to our lives with a compassion in action. The flow through these Four Paths will be celebrated as a community in song, dance, music, poetry, art and prayer.